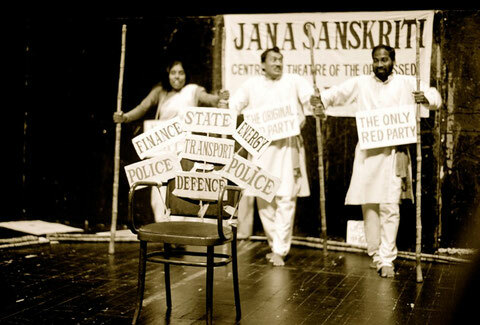 Members and founders of the India-based cultural movement “Jana Sanskriti”, which works through Theatre of the Oppressed to equip people for fighting against their daily oppressions; organizers of the biannual international Theatre of the Oppressed-festival “Muktadhara” in Calcutta, India. Sanjoy Ganguly has published various books on scripting power and practicing freedom on and offstage. Robert: What is Jana Sanskriti today, in 2013? Sanjoy: Today, Jana Sanskriti is a political space for marginalized people; a space that allows them to talk and develop an understanding about their issues. It’s a democratic space for doing politics through theatre, where people script power in theatre and in collective action. More and more this power is being applied by actors and spectators in real life, so they become ‘spect-activists’ as I love to say. People have the urge to be the rational thinkers and participants in the construction of human society. They don’t only talk about their immediate issues but also about policies. We are now doing forum theatre on the education system where we talk about the problems of the system. People are coming up with their own perspective as to how the education system should be structured. In the process of debate they develop an understanding of the issue and they suggest how to re-construct and radically reformulate the system. So people are no more implementing agencies of the policies created by the system. They are now drafting policies. So we have taken theatre to a level where people are really in the process of constructing human society. Sima: From 1985, the year Jana Sanskriti was born, to today our family has extended. Jana Sanskriti is not the name of an organization and or an institution, Jana Sanskriti is a large family. At this moment, there are about 500-600 actors and actresses. R: So Jana Sanskriti is not just an organization but it’s a big movement. Why do you think Jana Sanskriti is so “successful”? Sanjoy: First of all we recognize the intellectual abilities of people. They need to exercise the intellectual rights that they are deprived of. People cannot be satisfied with only bread, butter and salt. Intellect is something that human beings have and they don’t want to be neglected on that question. When their intellect is recognized and when they develop as rational and thoughtful citizens, they see it as their job to continue this movement. Secondly, we developed a strategy of being present in the community on a continuous and consistent basis. The teams are evolving from the community; they perform in their own villages. After being present over years and years they develop a connection with the spectators. 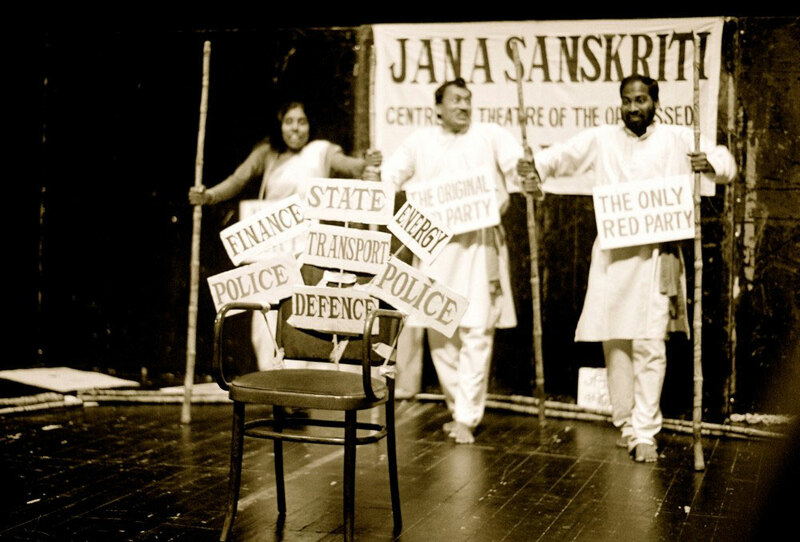 So Jana Sanskriti fundamentally thinks that people are essentially intellectual and secondly that Theatre of the Oppressed is politics of creating connection. Those two foundations allow people get connected to our movement, to this theatre and towards transforming society. We have developed a truly democratic relationship with the spectators and therefore we are a big movement today. Sima: I become we, we become they. We are not just saying this in front of people. We are practicing it. That’s why, I think, we have a feeling of collectiveness. There are members of our group that have been staying with this family for 20years; the youngest ones have been here for 16/17 years. We are not talking from our heads; we are talking from our hearts. Sanjoy always says that the time you go to direct a workshop you are cultivating your “I”. This way, you cannot destroy hierarchy and the workshop cannot become a space for real dialogue. For us, it is the we to conduct a theatre workshop. I am not I. This is what we practice in our group also. That’s why I think Jana Sanskrit, as Boal used to say, is “the largest group in the world”. If someone becomes part of Jana Sanskriti, his or her whole family becomes part of Jana Sanskriti. That’s why our family is really large, a really big family. Your parents are suffering from illness – that means our parents are suffering from illness. This spirit makes us come together and we try to grow it more and more. R: Boal called the Theatre of the Oppressed a “rehearsal for revolution”, nowadays we often say a “rehearsal for reality”. In Jana Sanskriti you say it’s a “rehearsal for the total revolution”. What does that mean? Sanjoy: With total revolution we mean people evolving as intellectuals. When actors and spectators develop a sociological understanding of their issues, they experience intellectual growth. That is what we call internal revolution. That breaks the passivity. That inspires them to go for an external revolution. So we are saying it’s a total revolution. The internal revolution is important for the external revolution. If the external revolution happens without the internal revolution you are speaking for the people instead of letting them speak for themselves. It is important that everyone experiences this internal revolution. The Theatre of the Oppressed movement should take care of both aspects, internal and external revolution. In my next book I am defining this internal revolution as the Esthetics of Theatre of the Oppressed. What you see in our theatre is the structural beauty – but when people in connection discuss and evolve together, they experience the esthetics. Internal revolution breaks self-interest. It means the liberation from “I”. That is why internal revolution is what we need to transform society and to create real collective action. R: Do you think this is possible in the Western world, which is very much based on “I”? Sanjoy: It’s very much based on “I”. I can see that people suffer from this pain of being individualistic. But the suffering because of “I” is also understood by people. So maybe there are still ways waiting to be discovered. We have to have optimism in our heart and something will definitely happen. Often I am told by my Theatre of the Oppressed friends that people in the West do not talk about their oppressions. I don’t think this is the fault of the people; it is caused by social conditioning. Most people live in alienation and isolation. Being always inside the invisible fence of individualism, they experience a disconnection. That reflects in the workshop; they cannot feel connected easily and therefore, they hide the real story that affects them. We must understand that and we need to know how we can deal with this phenomenon. Sima: Without practice you don’t get success. If you study mathematics you need to practice mathematics. And if you love someone you should practice the same way, right from your heart. Don’t only see people as short-term relations. If you genuinely practice that connection then you don’t forget how to use it. It is true. R: What do you think is the biggest challenge for Theatre of the Oppressed and its community in these days? Sanjoy: It’s a big question to me if the Theatre of the Oppressed community is a community or not because being in a community means the continuous sharing of thoughts, ideas and practices. You would not have to buy them as commodity. Sometimes I see that people buy the techniques and that creates a market. On one hand we criticize the market; on the other hand we create a market. Our head and heart are not always connected. This is a part of the internal revolution. The problem is that theatrical means are slowly slowly going into the hands of the privileged people and not into the hands of the underprivileged people at the margin. We must work on that and we must shout out loud. Of course, theatre is my profession but at the same time I am responsible to hand over the theatrical means to the underprivileged people. So working on this difference in practice and in what we preach is something that Theatre of the Oppressed is not doing as a community. Are we cultivating the rational thinking of the oppressed class or do we develop masters who love to direct workshops – this is a big question. Sometimes I hear people saying they direct workshops, they don’t say they are facilitating it. Secondly, I think that Theatre of the Oppressed is based on a cultural dialogue – but often there are multiple monologues because everybody is right. This dogma inside this movement sometimes makes me wild.If we only keep maintaining our own positions as a dogma, then we are challenging the concept of dialogue and debate in Theatre of the Oppressed. That is the most worrying fact to me. We must create a space where we should speak with our hearts in order to understand each other and in order to develop it [Theatre of the Oppressed], in order to go beyond where Boal has stopped. Instead, if we think we have the legacy and we are teachers then this will definitely cause problems in Theatre of the Oppressed. Then we don’t create rational thinkers, we create followers. Even though we’re talking about collective action, we are not really practicing it. That happened in every movement, even in the Marxist movement and in the Socialist block. They found some leaders, some new form of rulers. That is why they didn’t sustain. If Theatre of the Oppressed continues in this direction it will have problems. R: In the 28 years of the existence of Jana Sanskriti is there a moment that you consider as special? Sanjoy: That’s the most difficult question. Sima: There are plenty. How can I mention just one? In 2006, Boal was visiting the Jana Sanskriti Spectactors Rally and 12000 spectactors came from different villages. I saw Boal’s face that flashed. It was a strong feeling to see his happiness. He cried. It was a wonderful day. Two years later Boal died but he is very much with us. We did everything from his inspiration. “Jana Sanskriti is the largest movement in this world.” This sentence makes me feel that we really did something. It’s was special moment, a special day. Sanjoy: It’s special for all of us. When I say that Theatre of the Oppressed will not be a doctrine, that – like all philosophies – it has a lot of opportunities to go further, it’s actually the best way of showing respect to Boal. Sometimes people do not understand this. I have seen the way it has influenced me so now it is my responsibility to develop it. And that’s how we pay respect to Boal. You should have seen his face in the rally! And also the moment when there were multiple crisis’ in Jana Sanskriti. In 1997, we lost the support of an NGO that used to support us. It was a big crisis. We thought that probably this movement will go no further. But surprisingly from 1997 to 2000 we received so much support from people. That helped us and the crisis couldn’t break Jana Sanskriti. We didn’t know that our work has so much value for the people!